To take a closer look at our media product catalog software, download and install the free demonstration copy of a catalog software. With MyBusinessCatalog it's easier than ever! and any other catalog or online storefront, related to your business. Create a Catalog software. MyBusinessCatalog - solution for creating a digital catalog of products and services, PDF, online store or catalog for Android. One of the challenges to effective marketing is that not everyone is part of the Internet surfing community, browsing websites all day long. There are many prospects that companies cannot reach through their website. Regarding those that we can reach, how can we get them to make purchases of our products and services once they have gone offline? You can easily create a fully functional online store. The program will automatically upload and configure the required software on your web server, and you will be able to upload your data to it with a click of the mouse! For convenience in test-driving this feature, the program comes with dozens of demo stores. Check them out. All that is available even in the free version! One of the solutions to this problem of marketing is the creation of product and services catalogs on CD-ROMs. 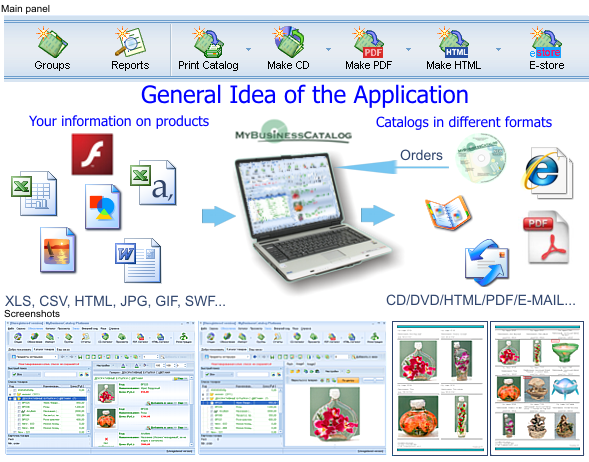 MyBusinessCatalog is a quick and remarkably easy tool for authoring such a catalog right out of the box. The catalog runs from the CD and doesn’t require any installation on the customer’s machine. It has all the tools for creating, printing, and submitting an order by email and supports updating product information via the Internet. Orders can be submitted as many times as desired. They can be grouped, received from several departments and consolidated before submission. The catalog can be distributed to customers and partners, and can even be shown as a slideshow at presentations and business meetings. A CD-ROM product catalog never grows stale. Its data is always updated over the Internet. This update procedure is completely automatic and behind the scenes. The new data is written to the hard disk, rather than back on the CD-ROM. Offline marketing with CD-ROM product catalogs is much cheaper than using only online presentations. For the small outlay of MyBusinessCatalog and some development time, your products and services can reach many more people than just having your website. The cost of offline distribution is zero, as your prospective customers get the CD-ROM from your hands. They use their own computer to update the catalog and submit an order. The creation of a CD catalog is a simple process. You simply enter the information about your company and products into the catalog, burn the customer portion of the catalog onto a CD disk and you’re done! Then give it out to customers so they will get the most complete and up-to-date information on your products while allowing them to create an order and submit it by email without ever browsing your website. Until recently, businesses that wanted to create a product catalog had only one choice – hire a company or an individual to develop one for them. This could literally cost hundreds of dollars. Now with MyBusinessCatalog , anyone can make a catalog in minutes without any creative ability or knowledge of Macromedia Flash or HTML. Burning a digital catalog onto a CD-ROM is cheaper than printing the same catalog on paper and the lifespan of an optical disk is longer than that of paper. Besides, you will not need to print a new catalog should you change the product or the product list. If necessary, you can print the catalog on paper right from the program. Running a consumer-orientated business in this highly competitive world without a product catalog on a CD-ROM would be like trying to run a business without a listing in the Yellow Pages. A CD catalog in many ways puts all the basic methods of communication into one very-necessary window through which your prospective customers can shop and place their orders. Download MyBusinessCatalog and start your marketing program right now!